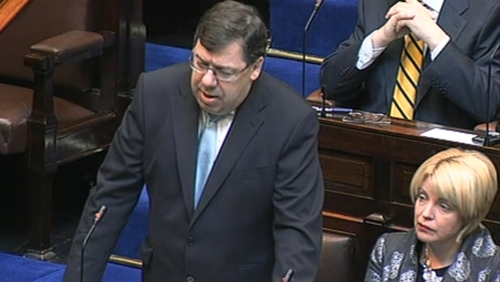 Taoiseach Brian Cowen has told the Dáil that the choices facing the country are very stark. But Opposition parties have questioned the figures on which the Government based its call for €15bn in cuts and tax increases over the next four years. At the start of a special two-day debate on the economy, Mr Cowen said no section of society could escape budgetary cutbacks, adding that December's Budget would be weighted more towards spending cuts rather than tax increases. Green Party leader John Gormley said the pain would have to hit the political system too, with changes to pay, ministerial transport, and the working hours of the Oireachtas. Fine Gael and Labour are still committed to getting the deficit down to 3% of GDP by 2014, but they are highly suspicious of the Government's figure of €15bn in cuts and tax increases to get there. Fine Gael's Michael Noonan said an adjustment of €9bn could be enough, while Labour's Joan Burton said only a change fo Government would make the bond markets believe that Ireland was 'on the up'. Sinn Féin's Caomíghín Ó Caoláin said severe budget cuts would prevent recovery, and that a better and fairer approach is possible. The Minister for Finance has said the upcoming Budget and economic plan represents one step back for the country after it has taken many steps forward. Brian Lenihan also said the Irish people will still hold on to most of the economic gains they won in the last decade. Speaking during the economic debate in the Dáil, the minister said following the unprecedented shock to the economy, the country's finances have been stabilised. On reducing the deficit by 2014, Minister Lenihan said the problems will worsen if action is delayed. He also said the measure in achieving that target will be painful, after earlier admitting that the €15bn adjustment over the next four years will have an impact on the living standards of citizens. Responding, Fine Gael's Finance Spokesman Michale Noonan said things are bad and that people are down and depressed. He said there is no growth, no hope and no economic plan. Mr Noonan said Fine Gael was not buying into the €15bn figure announced by the Government. He also said the Finance Minister's and the Government's biggest problem is that no one believes him anymore and that credibility has been lost. He said the dynamic of change must now take place. Earlier, the Taoiseach indicated that spending cuts will take precedence over tax increases in December's Budget. Mr Cowen said the country is entering a crucial period that would shape Ireland's future and if it made the wrong decisions the repercussions would be critical. He said the gap between what Ireland earns and what it spends was just too wide. Not every sector of the economy could be protected in the Budget, he warned. Opposition leaders have been very critical of the Government. Fine Gael leader Enda Kenny claimed the Taoiseach had not made a single concrete proposal in his speech, insisting the Government now had neither credibility nor a mandate. Mr Kenny said Fine Gael would not be brow-beaten into accepting all the terms of the proposed four-year plan. Labour leader Eamon Gilmore said there should be a 50/50 relationship between spending cuts and tax increases, but criticised the approach of the body known as 'An Bord Snip Nua'. Mr Gilmore said that Labour accepted the social welfare budget would have to be curtailed, but he also said there should be voluntary redundancies in the public service. Earlier, the Taoiseach confirmed that the decision to seek €15bn in adjustments over the next four years was taken by the Government. Mr Cowen was responding to Mr Kenny who asked if the target had been imposed by the European Commission. Despite the recession, figures from the Irish Exporters' Association have shown a strong increase in the value of goods and services exported from Ireland in the third quarter of this year. The Association said total exports of €40.4bn were up 9.3% on the same period last year. The better-than-expected figures during the period were helped by a weaker euro and increased Irish competitiveness.